Fill out our simple form and get quotes from local Crazy Golf Suppliers. Crazy golf is a fantastic addition to most events, regardless of location. Whether it’s in or outdoors, portable crazy golf hire is a sure way to keep guests entertained for hours. The fun and approachable style of crazy golf really makes it the perfect activity for guests of all ages and abilities. Due to the nature of the set-up, the holes can be set up wherever needed, meaning the size and shape of the required space can be very flexible. Crazy golf hire is popular for a range of events, such as children’s parties, weddings and of course corporate events. Game styles and lengths can be varied depending on the aim, whether that’s healthy competition between friends and family, casual putting games to break the ice or ‘round-robin’ to encourage team-building. For information about hiring crazy golf for your event, submit a quote request today and hear back from suitable suppliers. Put your way around our 9 hole course. All obstacles, putters, ball and scorecards are included. Ideal for weddings, school fayres, birthday parties and much more. Will go indoor or outdoor. Ready to Pop-Up at your party! Our 9-hole Mini Golf experience is this years must have item for your Wedding, event or corporate fun day. Impressive, hand crafted, traditional or wedding themed crazy golf game complete with 9 holes and tricky obstacles to keep your guests entertained. 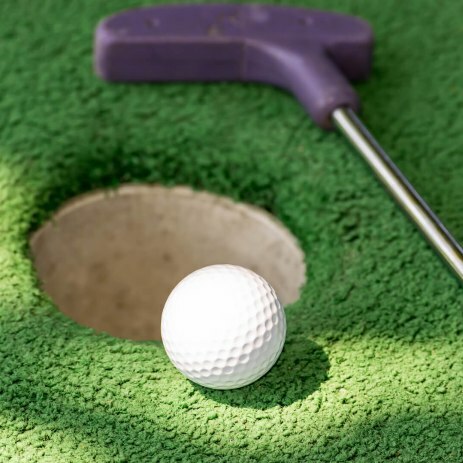 Our Mini Golf holes are a great way to get your guests interacting with your event. Great for weddings, hospitality & corporate events. The beauty of crazy golf hire is the accessibility for all guests. Unlike many other activities, crazy golf allows as many or as few participants on the course at any given time. The layout can be adapted depending on the venue, and can be compactly arranged indoors or sprawled across an outdoor space. For more information about crazy golf hire, simply submit a request today including information about your event, venue and guests, so whether your attendees are shooting for birdies or bogies, you can ensure they’re having fun!